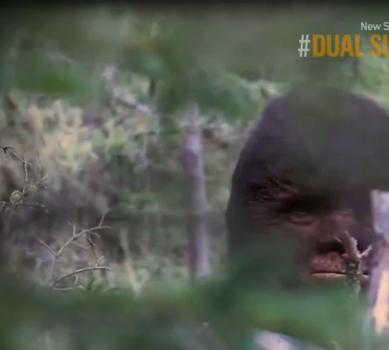 Survivorman Bigfoot: Part 2 of the special created for the Travel & Escape Channel in Canada and the Discovery Channel in the US. Thanks to Bigfoot Evidence for finding this video. During the making of Survivorman Alaska in 2009, SURVIVORMAN LES STROUD experienced his first possible Bigfoot encounter. "The strangest thing happened...I was making my grass mat and all of a sudden a deep and very loud grunting noise about fifty yards away brought me to my feet and put the hairs up on the back of my neck. It repeated five times and I have to say it sounded...just like a large gorilla..."
Les acknowledged the experience, but didn't speak publicly about it until February 2011. In an interview with 93.3 KZOZ, hosts Jeff and Jeremy In The Morning asked if Les had ever had a Bigfoot encounter. Les unexpectedly opened up about his Alaskan encounter. "It sounded like a big ape, that's all I can tell ya'. The interview has been viewed over 250,000 times since. This interview sparked thousands of Les Stroud fans from around the world to weigh in on the Bigfoot debate. Fans described their own Sasquatch encounters via email, letters and social media and demanded Les secure proof. Overwhelmed by the response, Les has decided to uncover the truth. Joined by Bigfoot expert TODD STANDING, Les travels to two remote Bigfoot hot spots to debunk the myths that surround Bigfoot phenomena. TODD STANDING literally made international headlines with his incredible video footage and physical evidence of Bigfoot. Dozens of major networks and production companies have attempted to negotiate agreements with him. From the beginning, he has maintained his work is repeatable with the statement, "Don't take my word for it, come with me and I will show you first-hand the reality of this species." For expeditions to yield any success, the search must be made by the most elite of wilderness experts who have the experience to film in the extreme conditions one can expect from the most remote locations. Of the 7 billion people on the planet, only LES STROUD fits the criteria.